In 2013, Professor Hans Georg Näder became the majority shareholder in Baltic Yachts. 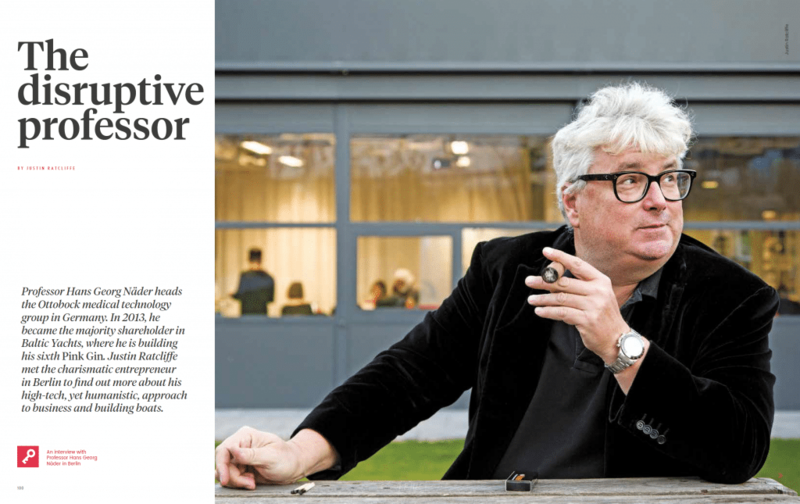 Now he shares more about his vision and thoughts on the future in Super Yacht Report 3/2013. Our meeting takes place at the Ottobock Science Center in downtown Berlin. Known as the ‘muscle house’ for its organic facade inspired by human muscle fibres that also recalls the flowing lines of a yacht, the building is an eye-catching piece of architecture among the city’s traditional stone buildings. Näder has just flown in from Rio de Janiero where he had attended the Paralympic Games. His company has been at the heart of the Paralympic movement since the 1988 Games in Seoul, and the Science Center provides interactive insight into the technologies the company has developed to enhance mobility. These solutions range from carbon-fibre running blades and custom wheelchairs for Paralympic athletes to microprocessor-controlled limbs that simulate the natural movement of the knee joint and bionic hands that can be controlled by muscle signals to execute different types of grasping. The company’s commitment to neuro-orthopaedic research is personified by two bronze sculptures of a homunculus on the roof of the Science Center. Derived from the Latin for ‘little man’, the curious figures represent a neurological map in human form of the motor and sensory parts of the body. Read the full story here in the latest issue (03/2017) of the SuperYacht Report.